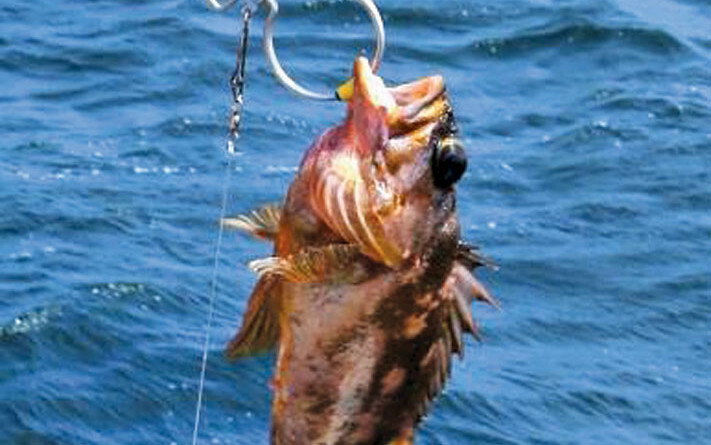 STATEWIDE — It is not uncommon for an angler to reel in a rockfish and believe – because of eyeballs popping out – life has left the scaly red/orange body. Rockfish generally suffer from barotrauma as it nears the water’s surface, causing its eyes to bulge from its socket and stomach to protrude out its mouth. A pair of bulging eyeballs and a protruding stomach, however, does not indicate all is lost for the brightly colored fish. Descending a rockfish back into safe water depth can save the groundfish species. A National Oceanographic and Atmospheric Administration (NOAA) states a rockfish can revive itself despite barotrauma if it is descended back into the water 2 minutes after it is caught. Weighted upside-down milk crate with rope: NOAA suggests dropping a crate, attached to a rope with the open side facing the water, over the buoyant rockfish. With the fish inside, drop the crate to about 60 feet below water level and wait for it to revive itself and swim away on its own. Rough seas might prevent this technique from working effectively. Inverted barbless hook with weight: Be sure to hook the rockfish, with an inverted barbless hook, through its lower lip and from inside out or the upper lip membrane from outside in. Then drop the rockfish into the water and allow the weighted hook to guide it into the water. The weight must be heavy enough to allow the rockfish to sink deep enough into the water. Sharply yank or jerk the line at the proper depth to allow the rockfish to release. This is an ideal technique for smaller sized rock fish. Be sure to place the hook in such a way it does not puncture the extruding stomach. Commercial fish descenders: This might be the most practical tool to use. Which one works best depends what you are able to find (and afford) on the market. Follow the instructions of whichever commercial hook you purchase. The state’s Department of Fish and Wildlife discourages venting. Also, throwing a rockfish suffering from barotrauma will not spare the groundfish species from dying; the inflated fish will just float on the water’s surface, failing to regain any life. NOAA’s complete brochure of how to handle rockfish above and below water can be found here: 1.usa.gov/1DSP8uY.